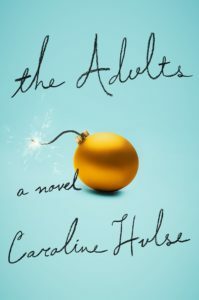 The Adults by Caroline Hulse is about two divorced parents in England – Claire and Matt – who decide to spend Christmas together, along with their current partners, so that they can both spend the holiday with their seven year-old daughter. Their partners – Claire’s boyfriend Patrick and Matt’s girlfriend Alex – reluctantly join them, leery of how the long weekend will unfold. Unsurprisingly, as the days pass, nerves fray and old tensions resurface, while both relationships are tested. The weekend ends with an archery incident that sends one of the four to the hospital (not a spoiler), with the book gradually explaining how they got to the point that one of them was shot by one of the others. This book is meant to be funny, and it definitely has its funny moments. I liked Hulse’s little observations about parenting and relationships, and the fun she pokes at The Happy Forest, the family-friendly resort that this doomed fivesome chooses for their holiday. The partners are insecure about Claire and Matt’s relationship, Alex is a recovering alcoholic and a very bad drunk, while Patrick secretly tries to flirt with a popular girl from high school who is coincidentally at the resort at the same time. And Scarlett – the 7 year-old daughter – talks incessantly to an imaginary giant stuffed rabbit. I listened to The Adults on audio. The narrators – Penelope Rawlins, Peter Kenny, Sarah Ovens – were entertaining. I especially liked the narration for Patrick – I assume that was Peter Kenny – because he made Patrick seem so desperate, yet sympathetic at the same time. If you like wry British narrators, you’ll enjoy this one. In the end, I found The Adults to be mildly entertaining and pretty forgettable. None of the characters was particularly likable, and while their predicament was unenviable, I grew kind of impatient by the end with how poorly they coped with the weekend. The archery incident was unrealistic and over the top. So I give The Adults a rather tepid recommendation. In Espach's charming coming-of-age debut, 14-year-old Emily Vidal's life begins to veer off course at her father's 50th birthday party when he announces that he and her mother are divorcing. The birthday night ends with dad kissing the neighbor, Mrs. Resnick, in the woods, where Emily and Mrs. Resnick's son, Mark, discover them. The disorienting discoveries continue: Mark's ailing father commits suicide, and Mrs. Resnick is pregnant with Emily's dad's baby. With dad off to Prague and her mother undone by the affair and hitting the bottle, Emily loses faith in all the adults around her, even as she is becoming one of them. Emily starts an affair with an English teacher 10 years her senior, mostly to see how far she can go, which turns out to be pretty far. She and the teacher, Jonathan, who leaves teaching to become a lawyer, return to each other again and again as Emily graduates from college and moves to Prague to be with her father. Espach perfects the snarky, postironic deadpan of the 1990s and teenagers everywhere, and her ear for modern speech and eye for fresh detail transform a familiar story into an education in what it means to be a grown-up. Carol Edgarian’s Three Stages of Amazement shares a surprising amount of common ground with last year’s most argued-about novel, Jonathan Franzen’s Freedom. Whatever the overarching themes of either book may be, it’s the sharply observed detail and intensity that matter: the spectacle of high-strung, hot-blooded, restless people conflating their own private crises with the political and economic turmoil of their times. What Halliburton and the Bush era were to Mr. Franzen, Silicon Valley and the Obama presidency are to Ms. Edgarian’s turbulent, furiously compelling book. I'd love to hear from anyone who has read these yet – worth pursuing? Thanks!